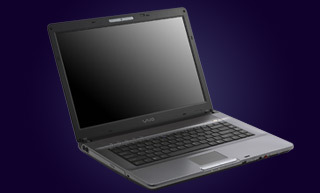 The Sony Vaio VGN FE31M is an entertainment notebook equipped with the Intel Core 2 Duo T5600 processor and GeForce Go 7600 Graphics Card. The VAIO FE Series is setting a new visual benchmark for mobile multimedia. With its fully converged communication, including MotionEye™ integrated camera, microphone, pre-installed Skype™ and Bluetooth® video-call on the move is a reality for every user. That's not all: Running on Intel's Core 2 Duo T5600 processor, the VAIO FE Series brings super-fast, no-compromise portable excellence to all - for business, for study, for fun. NVIDIA GeForce Go 7600: The NVIDIA GeForce Go 7600 is a middle class video card of the 7000 series and suited for games of the year 2006. The performance is very similar to ATI X1600 / X1700. Compared to the desktop 7600 it is clearly slower. Only some 3D games with very low demands are playable with these cards. » Further information can be found in our Comparison of Mobile Graphics Cards and the corresponding Benchmark List. Slow clocked dual core processor based on the Merom core featuring virtualization functions VT-x. 15-16 inch is a standard display size for laptops and offers the biggest variety of products. Sony: Sony Corporation is a multinational conglomerate corporation headquartered in Japan. Sony is one of the leading manufacturers of electronics, video, communications, video game consoles, and information technology products for the consumer and professional markets. Its name is derived from sonus, the Latin word for sound. The company was founded 1946 with another name and renamed in 1958. Sony Corporation is the electronics business unit and the parent company of the Sony Group, which is engaged in business through its five operating segments—electronics, games, entertainment (motion pictures and music), financial services and other. Sony is a notebook manufacturer of medium size according international market shares. From 2014, Sony has reduced the production of Vaio laptops and finally discontinued them. Sony is still present in the smartphone and tablet market, yet not among the Top 5 manufacturers. 90%: There do not exist many models, which are rated better. The most ratings get ratings, which are a bit worse.